Koethaung pagoda is situated one and half a mile away from the east of the palace site. After king Min Bar had passed away, the crown prince Min Taik Kha took the throne of Mraukoo in AD 1553. 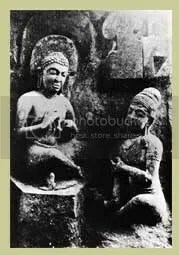 When king Min Taik Kha was ill, the prophets told humbly that the king would die next six months, but if he wanted longevity in life, he must make nine astrological contrivances in terms of Buddha therapy. According to the prophet’s advice, Koethaung pagoda was built in the east of the palace in AD 1553. He managed to finish the pagoda within six months. No sooner had the pagoda been finished then the king recovered from his illness. He was crowned as king with his queen Saw Than Dar, and he passed away after he had ruled Rakhine for three years. There is a cave tunnel around the pagoda. Nine stupas are above the cave tunnel. 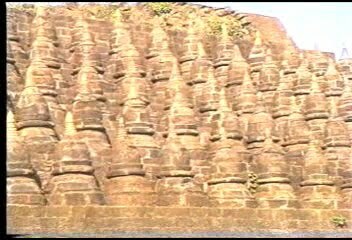 Nowadays, they fell down and debris of those stupas are blocking the cave tunnle. 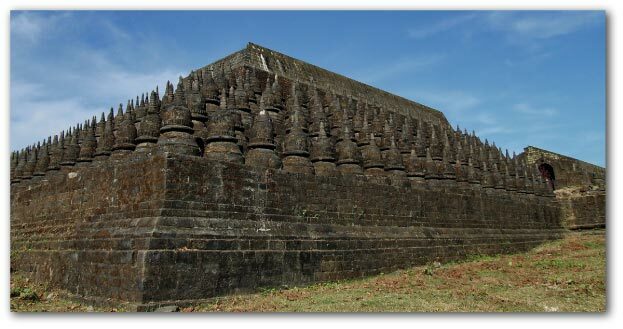 There are five levels inside the outter wall, and one hundred and eight pagodas which were made of stone, are at the southern level. The big stone stupa is at the centre of Koethaung pagoda. The pagoda and pagoda platform are roofed with the prayer hall. The entrance to pagoda is in the east. If the pagoda is escended from the eastern entrance, it is accessible to the pagoda platform of the previous prayer hall. There are an entrance and an exit to the cave tunnel at both sides of left and right of the pagoda court. As the entrance fell down, lots of stones are blocking it. The base of the western facade is 250 feet in length and the bases of the southern and the northern facades are 230 feet in length and the wall of the pagoda is 30 feet high. The walls of the terraces of the pagoda were made of bricks which are 3 feet and 8 inches in size and they were the biggest bricks of Mraukoo period. King Min Taik Kha stayed temporarily in the east of the pagoda. The royal head-washing lake is near the north of the temporary palace site. The kings of Mraukoo period held the royal head-washing ceremony at that lake. The legend has said that Koethaung pagoda fell in ruins owing to the thunderbolt hitting because king Min Taik Kha, a son of king Min Bar who built Chitthaung pagoda, did meritorious deeds superior to his father’s. In fact, Koethaung pagoda was not as strong as Chitthaung pagoda because it had to be built in the six months. The pagoda demolished without long durability because lots of bricks were used than the stones. 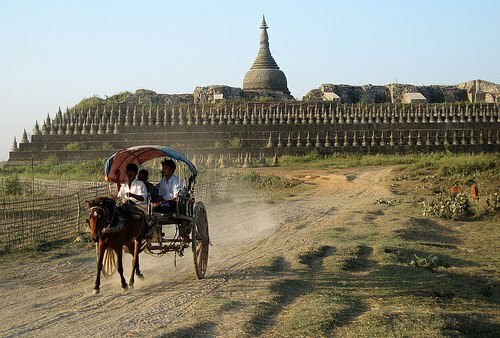 When Koethaung pagoda was excavated in 1996, the underground cave tunnels around the pagoda, appeared.